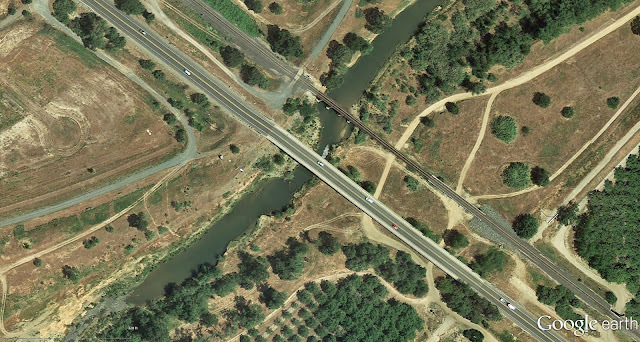 Highways and railways often share the same right-of-way, and so the State Route 65 Bridge (19 0013) and the Union Pacific Bridge sit side by side across the Bear River. Actually, the SR 65 Bridge is on the south side of the border (which is the Bear River) as shown by the ''19' in its bridge number (for Placer County). The Bear River Bridge is a 15-span, continuous reinforced concrete T beam viaduct with a 62 ft maximum span length and a 660 ft total length. It's 44.5 ft wide with two traffic lanes and wide sidewalks and shoulders and it was built in 1965 and improved in 1998. It carries about 14000 vehicles a day and has a sufficiency rating of 82%. This bridge is supported on thin pier walls, which may be a problem if there is much longitudinal earthquake displacement. Secondary moments due to eccentrically applied dead load can push pier walls over, especially if there is a significant gap at the expansion joints. 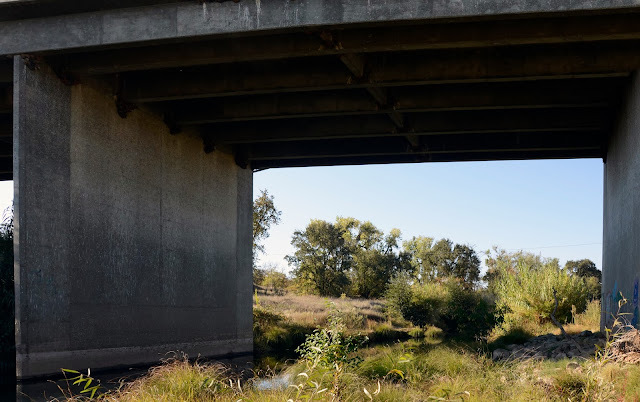 Yuba County, California Bridges: State Route 65 across the Bear River by Mark Yashinsky is licensed under a Creative Commons Attribution-NonCommercial-NoDerivs 3.0 Unported License.